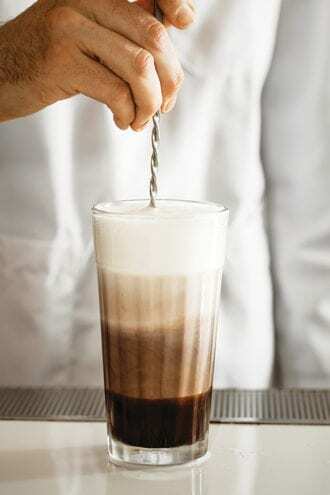 Careful preparation is at the heart of a perfect chocolate egg cream at Russ & Daughters, where they’re known for this and other variations on the classic frothy delight. Add the syrup and milk (it’s essential that the milk is very cold) to a tall glass. Add seltzer until the level is one inch below the top of the glass. Stir in a back-and-forth motion (not a circular swirl) to combine. Let the mixture settle for a moment, then top with additional seltzer, producing a thick, white head of foam. Serve with a straw.